Calhoun County, one of Michigan's eight "cabinet counties" due to being named after one of President Andrew Jackson's cabinet, allows genealogy and vital records research at the Count Clerk's office in Marshall, MI., on 315 West Green Street. They offer birth, death, and marriage records all ranging from 1867 to the present, and marriage ceremony records begin in 1837. Up to six researchers are allowed at any one time. Land records are also available from 1833 to the present. Calhoun County is home to Battle Creek, the third largest city in Michigan. The county was named after John C. Calhoun, the Vice President of Andrew Jackson; he was also the U.S. Secretary of State, and Secretary of War, along with a South Carolina Senator. 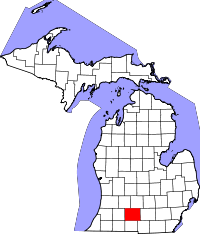 Calhoun County is located in south Michigan, close to the Indiana border, and almost 140,000 people reside there.